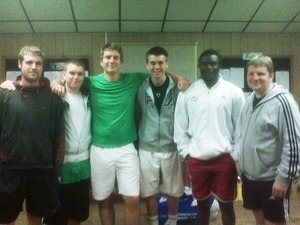 Rainford Tennis Club’s Men’s 1st Team have won their division and clinched promotion in the Liverpool Tennis League. The 'Green Army', who only lost one match all season, won the title on the final day of the season with a 6-0 win at Eccleston Park. The full squad for the season was Dave Hillier, Sam Jalloh, Conor Porteus, Andy Corish, Simon Webster, John Machin, Jon Fenney, Rob Jones, Andy Gillespie, Jamie McCafferty, Joe Machin, Lec McKnight and Sam Sheen.